As this topic has come up a few times recently, I thought I would do a guide for fitting a pair of uprated anti-roll bars. This the easiest way I found to do it after realising I couldn't get the bar out because the ARB brackets foul the steering rack. There may be other ways, but this will certainly get the job done! An ARB kit of your choice. H&R and Eibach are both popular and top quality. Personally I would choose 26mm front, 22-23mm rear. Make sure the front bar comes with prefitted clamps. Most do I believe since that is how the OEM ones are constructed at the factory. Optional, but recommended whilst you're down there - 4 x drop links and 8 x nuts (4 x 16mm - rear, and 4 x 18mm - front). I would check you can remove the nuts at the ARB end before proceeding with the job. You don't want to start the job, only to find you have to give up because you can't undo the nuts. The spline recess rounds out super easy. My front ones had to be hacksawed off. Be prepared! A triple square socket selection, but the splined recess in the drop links is M6. Anti-seize grease for the bolt threads to make future dismantling easier. Jack the car up nice and high. If you are replacing the rear drop links, remove the rear wheels as it makes access to the upper drop link nut a lot easier. If you are keeping your existing ones, the wheels can stay on. I had just sprayed everything under there with Wurth cavity wax (similar to waxoyl), which is why it look wet. For adjustable rear bars, the outermost hole is the softest setting. This bar is set to soft. Jack the car from the 18mm console bush bolts nice and high. Place your axle stands on the factory pinch weld jacking points (an arrow on the sill points to them). I'm not going to sugar coat it - this can be a b1tch of a job, even for experienced people. Grab a beer, have a fag if you smoke and just be calm, confident and methodical. It's easily doable if you don't lose your patience and start cross threading bolts! Remove the belly tray and both lower wheel arch mouldings. Remove the dogbone from the subframe and gearbox. Remove the lower drop link nuts - Crack the 18mm nuts off with a breaker, then get a ring spanner and M6 spline and undo the nut whilst holding the bolt still with the spline tool. If the spline rounds off, you will need to hacksaw the fecker off just above the ball joint. Just as well you bought new ones, right? 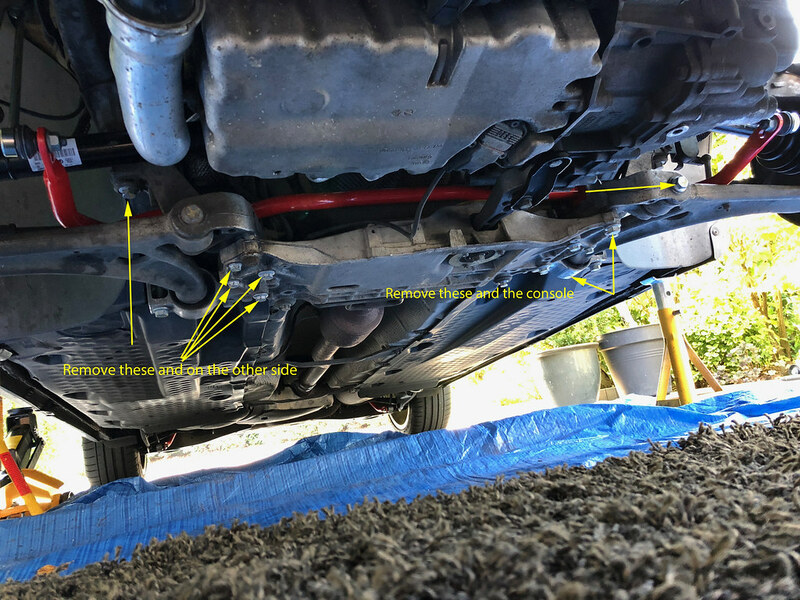 Remove the bolts pictured and the passenger side ball joint nuts x 3 (16mm). 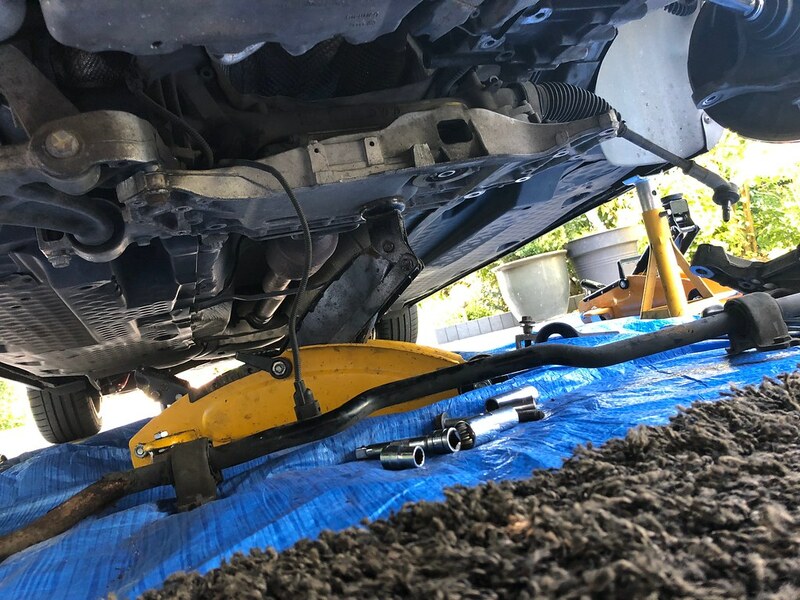 The subframe needs to come down a little way, so the steering rack and ARB need detaching completely. Remove the passenger side wishbone. 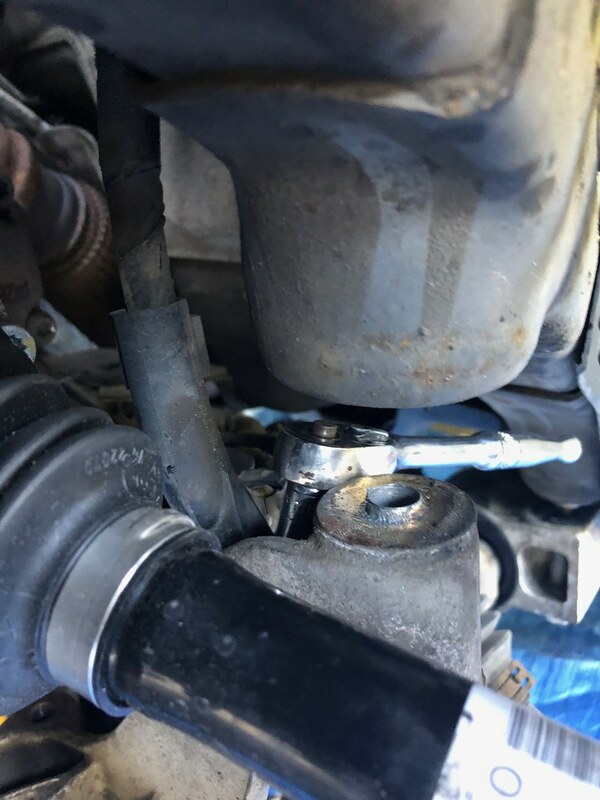 Before you pull the big alloy bracket out, you need to detach the steering rack loom and also the wishbone sensor bracket if you have xenons. The rack loom is attached to the alloy bracket with a 10mm bolt. Have a feel around in the hole where the ratchet is in this pic, you will find it. Wind these bolts out several turns. 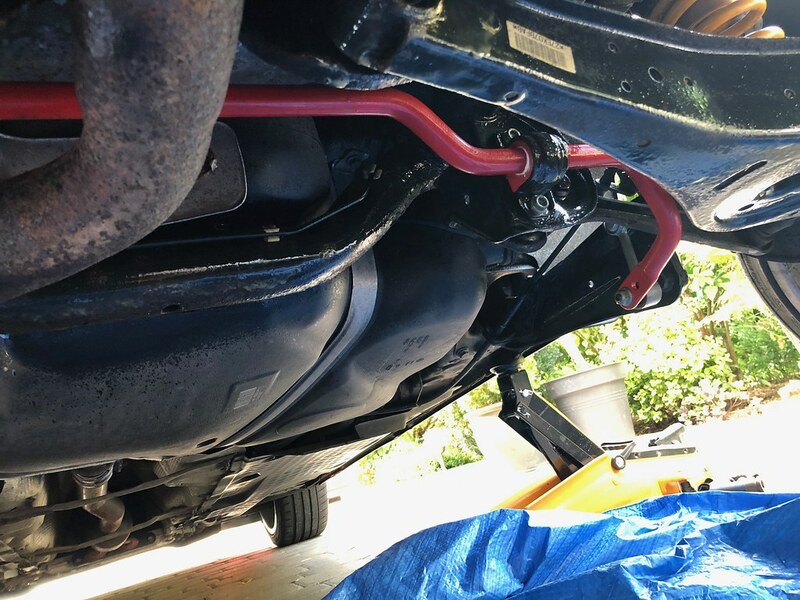 The objective is to have the subframe 'hanging' to allow you to wiggle it around to get the ARB out. Don't remove them completely. 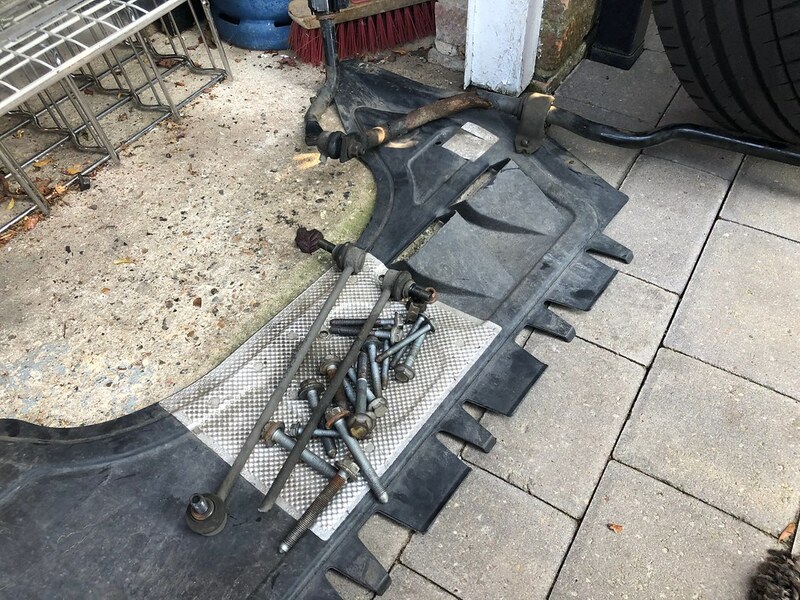 This is what you need to end up with - The passenger side subframe leg (and therefore the console bush and wishbone) completely removed. 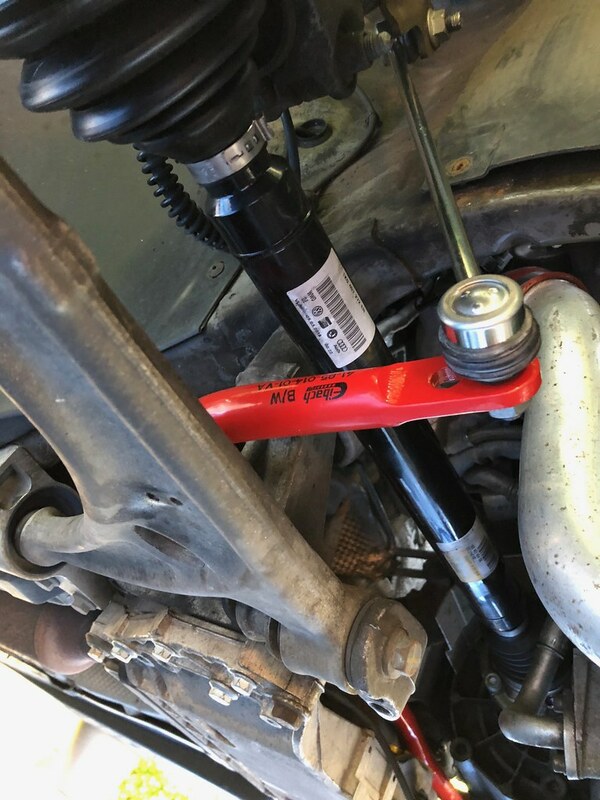 You might not need to detach the tie rods. I did, just to get as much room as possible but you may be OK not doing that. Now you can remove the old ARB. Pull it towards you from the passenger side, turn it 90 degrees towards the driver's side and walk the bar out. You will see how to get it out, it's easy. Stick your new ARB in. 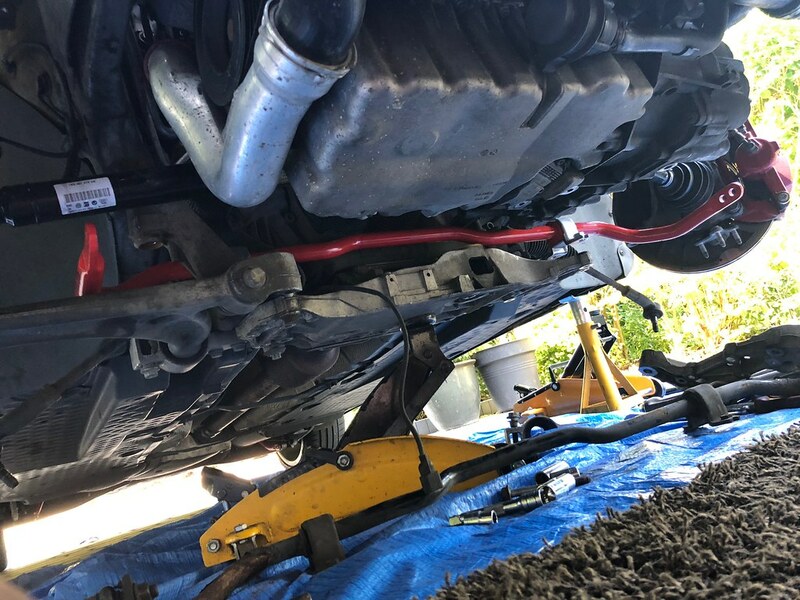 Walk it round the back of the driver's side alloy bracket first, then push the rest forwards onto the subframe. Do not reuse the old bolts. I won't clog up this guide as to why stretch bolts are used and why you must replace them, suffice to say, don't be cheap - just buy new ones! For adjustable front bars, the outermost hole is the softest setting. This bar is set to soft. The usual pile of waste following this kind of work. Please do budget for new bolts as they can bump up the bill a fair bit. 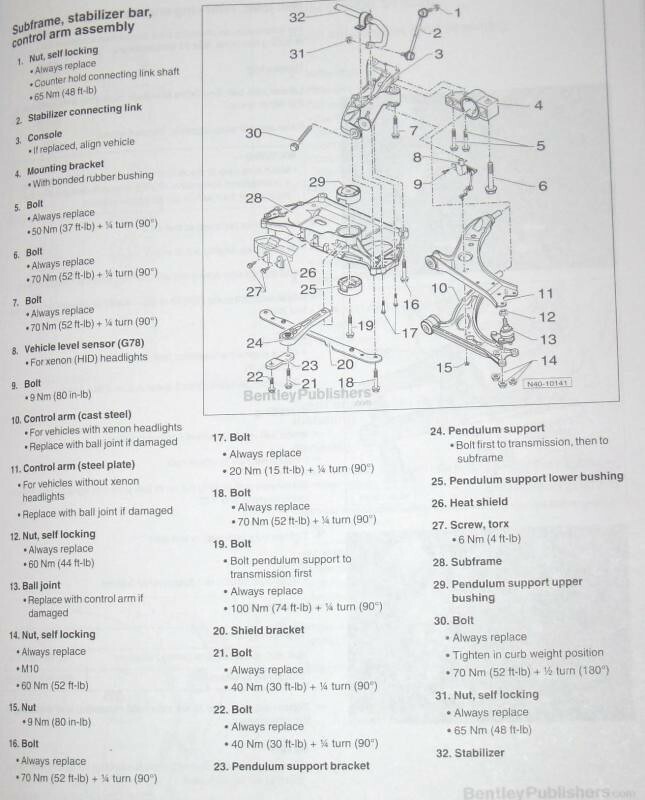 Here are the torque details for the subframe bolts. You can use that to help you order the right ones from VW, or 'VAG bolts' on ebay. If you don't have a Deadset, get yourself an alignment booked in and take it easy in wet! You may be lucky and it all goes back on straight, but I highly doubt it! Expect the steering wheel to be off a few degrees and a pull to the left or right. I just wanted it done. My nearest trusted indies are miles away, and it's not a job I would give to a local dealer.....mega ££££s, and they don't like fitting mods anyway. The worst that will happen is you'll have to pay for an alignment, which the dealers are actually very good at usually.....and local.